Significantly, all these officers are of 1989 batch whereas IAS officers of 1996 batch have been posted as joint secretaries. Indian Revenue Service officer Satya Prasanth who has written a series of poplar blogs on the need to have pay parity among IAS and other services, argued in an article last year how there was only one Indian Forest Service officer (as on February 12, 2014) out of 128 officers of various services who had enjoyed the secretary’s pay, or the apex scale of Rs 80,000 (fixed) per month. Out of 128 mentioned there, as many as 95 belonged to Indian Administrative Service. 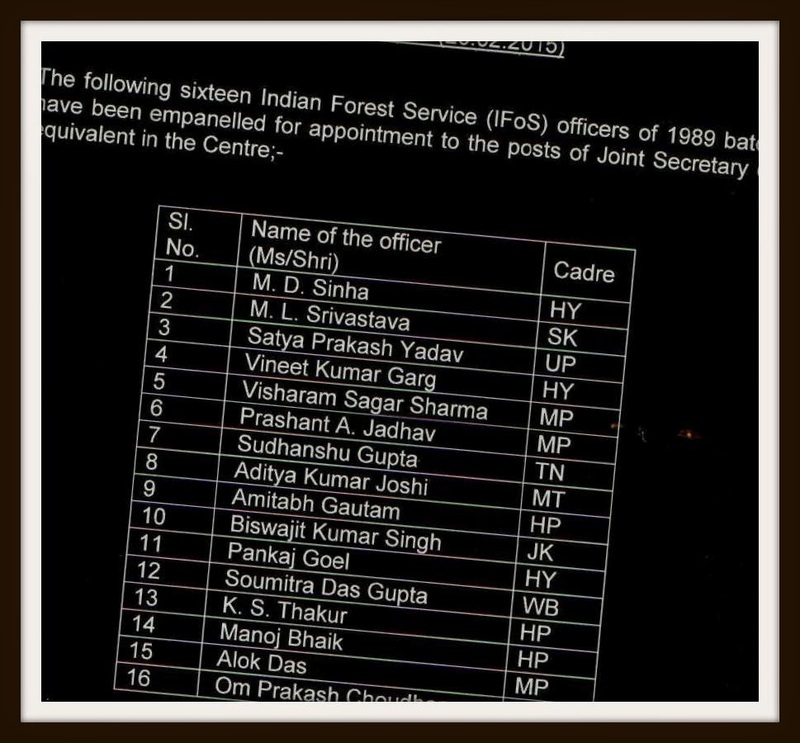 In fact, one secretary level post occupied by an Indian Forest Service officer is that of director general of forests (equivalent to special secretary). The question that has however remained unanswered is whether the 7th Pay Commission would look into the grievances of Indian Forest Service and other such services who have been expecting a better deal this time round. The IFS officers gets the worst deal despite being one of the only three premier All India Service of the country especially in an era when specialists of environment,forests and climate change should be accorded top priority and made indispensable in every sector of the government! Deplorable and regrettable high handedness of the IAS once again! arre what do IFoS guys know except environment and forests? why do you guys want postings in non environmental departments? Yes they know only about environment and forests.. What the hell IAS doing in MoEFCC? Move them out of ministry.. Keep it exclusively for IFS.